Stunning Keisha: Happy Independence Day! Every July 4th, aka Independence Day, the peeps head out to the courtyard to grab a good seat to watch Macy*s 4th of July fireworks. They've been kind enough to have it on the Hudson River for the past few years. There are no big crowds—only neighbors who live in the complex—and no traffic to contend with. Here I'll mention that I'm left alone in the apartment while they're out there oohing and aahing. There were a couple of nice fireworks' displays in June that the peeps could watch from their window, whether they took place in Central Park, Times Square or da Bronx. Here's a short video that TW took of a small part of last year's Macy*s fireworks display from our courtyard. Please excuse the quality. If you look closely at the 2nd part, you can see the Empire State Building lit up in red, white and blue in the background. You can watch it on YouTube here. The music is a song called Independence Day by the Orphan Trains. The lady singing is somehow distantly related to TW although they've never met. Enjoy July 4th safely. 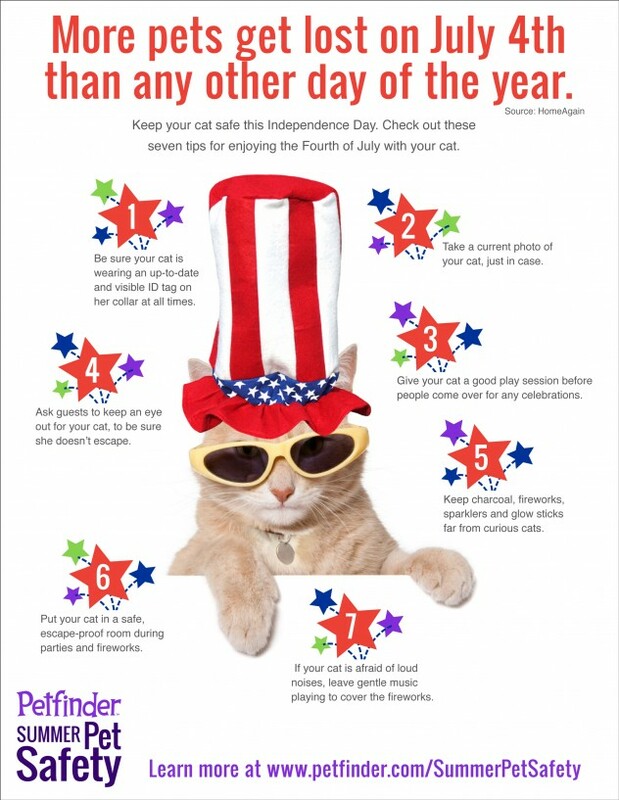 Be responsible and remember that fireworks can scare your furry family members so keep your cats indoors and keep a leash on your dog so he/she doesn't run away. The Durham-Middlefield Patch has some good tips for keeping us safe on this holiday. You might also enjoy into Infographic from the good folks at Petfinder.com. Click to biggify it. Hope you enjoy our new summer look, created by the very talented Glogirly. Even ghetto kittehs have to go to the beach once in awhile. Excuse me while I rifle through these unattended beach bags to see if there's any green papers noms. For a great header or for any of your design needs, look no further than Glogirly Designs. Disclaimer: I was NOT paid to say that. We LOVED the song, and the bestest fireworks we've seen (Mommy has seen a LOT of them--*ahem*). Have a wonderful spoiled kitty and guardian day! 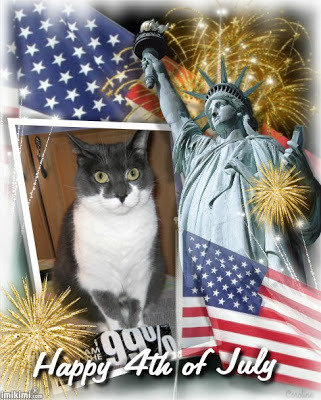 My human has always wanted to celebrate the Fourth of July in New York City. This year she ain't going nowhere - she's sick and trying to finish a story that is past deadline! Keisha we wish you and your peeps a very happy 4th of July. Enjoy the day and we hope the boom booms are not too bad. We really like you new beachy look, especially the shades. Love your summer look, CK! We hope you TW, and Pop have a great Fourth. Hopefully the fireworks won't be too loud. Happy 4th, CK! Our head peep loves fireworks and thinks it's great that TW can see them without going farther than the courtyard. Happy 4th of July, CK!!! That's a really HUGE fireworks show TW and Pops get to see! We have a big one here just a couple of blocks away. This year Glogirly's concerned it might scare Waffles. ...she really ought to be more concerned about ME scaring Waffles. Love your new look on the blog. Happy 4th to you all - we got lots of rain today - yeck! Happy Independence Day CK! We are supposed to have a monsoon at firework time here...paws crossed! You're header is beachie good CK!!! How cool that your peeps get to see the Macy fireworks! We aren't too particularly fond of fireworks...too loud! We hope you all are enjoying the 4th of July. That's a great video of fireworks. Your humans have such a nice view! And with no crowd or traffic! It's been raining today, so we might not have fireworks...which is good news for my boys :-) Have a safe and fun day. Happy 4th of July! What a great video dear CK. And I love your summer look. Did I hear a rumor that you want Waffles Too to come and stay with you for the summer? Hm? Luvs da video... got lots of fireworks but no thundering! Happy Independence Day to you dear Keisha! That was a cool song. Wow--your Peeps have a front row seat on the fireworks, eh? No that that means anything to the kitty except hiding UTB with your little pawsies over your tender ears. Now CK, I have to warn you about our post tomorrow afternoon. The *Human* thought it would be funny, but *I* know that blue cushion is yours whenever you want it. So don't blame ME! Heh heh. Hope you guys had a nice day! Great fireworks in the video. We get to watch fireworks from our house too. The city launches them in the park across the street every year. And almost every weekend in summer, the minor league baseball field over there launches some too. Tonight, both the city AND baseball field launched their fireworks at the same time. Pretty cool! I hope you all had a wonderful 4th of July! It looks like you are located in a perfect area. How lucky you are to be able to see them right at your own place! Too cool!!! LOVED THE VIDEO and the song is fabulous, it DOES suit you! CK girl, that song is YOU!